Since we last "spoke" I've officially become Mrs. Lighty (the 3rd, as I like to call myself), enjoyed two fantastic vacations with my hubster, one being our amazing honeymoon, and started officially, and purposefully decorating our home. It's so much fun! Before I get into the de-licious recipe I whipped up, I'll share with you a few amazing photos of life thus far. Outside our hotel, "The House". We highly recommend it! Okay, now on to the yummy stuff. In celebration of writing again, I busted out our new formal dishes to make tonight's dinner a little bit more shmanzy. I found this recipe in Better Homes and Gardens May issue and decided to give it a go. Honestly, it looked super easy and called for ingredients I already had in my pantry, so that's why I decide to earmark the page and save it for a 'rainy night' (literally). In a small saucepan, combine apricot spread, honey, soy sauce, ginger, garlic, and cayenne over medium-low heat. Cook until the apricot spread is melted. Remove and stir in vinegar. Set aside to cool. Line a 13x9 inch baking pan with foil and arrange the chicken on the pan. Pour the glaze over the chicken, turning pieces to coat on each side. If you decided to use bone-in chicken thighs, arrange the chicken so that the skin sides up. Bake for 40 to 45 minutes. Brush with glaze two times throughout baking. Rinse beans in colander. 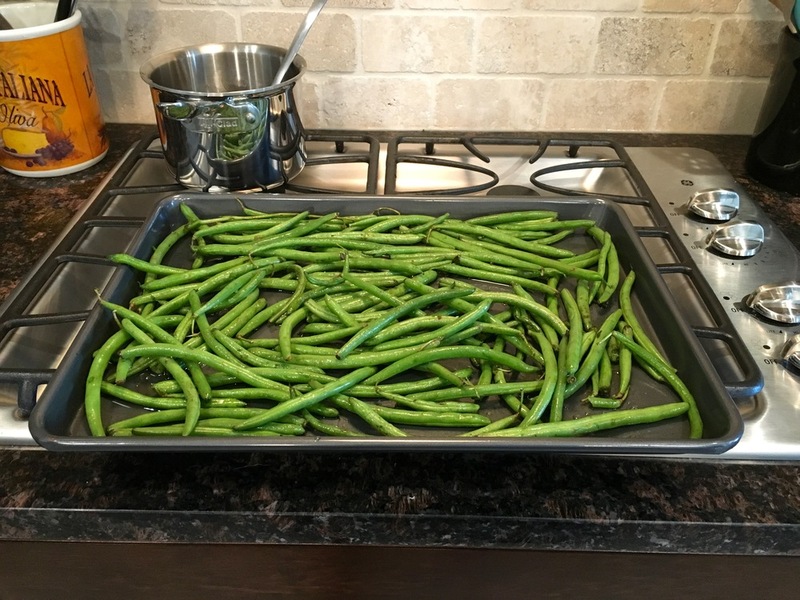 Spread the wet beans on a baking sheet sprayed with a light coat of cooking spray. Drizzle with olive oil and salt. Toss to coat. Spread evenly on tray and roast for 20 minutes. I went ahead and put mine in the oven along with my baking chicken. While the beans are roasting, heat the remaining Tbsp of olive oil in a large skillet over medium-high heat. Add garlic. Add Panko and stir for about 2 minutes. Then, add zest, tarragon, salt and pepper. Stir to combine. When the beans are finished roasting, toss in Panko mixture and serve. I have a slight obsession with potatoes... in every form... so I made some mashed potatoes as an additional side. Scrumptious!